One of the undeniable positive aspects of trade shows is getting the rare chance to hang out with old friends. 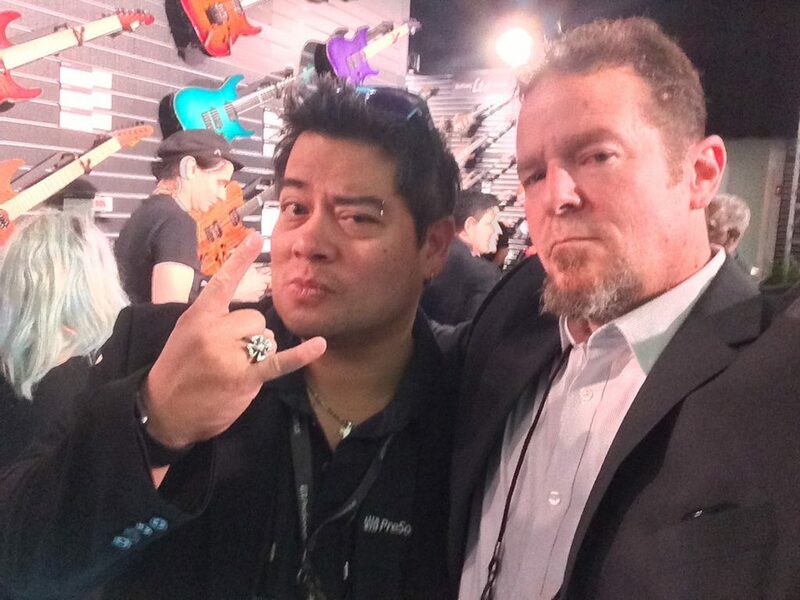 Here’s my buddy Gus Lozada, currently of Presonus, with me at NAMM 2017. 2017 marked the occasion of my 24th consecutive year of working with exhibitors at the winter NAMM Show. My first year working NAMM was 1993, which seems roughly 17 million years ago (and still sometimes feels like yesterday). There are many aspects to working a NAMM Show in my youth that are markedly different from how I approach the show today. I genuinely can’t imagine how I functioned back then, staying up until all hours at the Hilton bar and partying with my friends, and then attempting to be effective the next day at the booth. I’m a little more boring now than I was in my early 20s, but I can make every moment count at the show, which has its benefits. At the 2017 show, my main exhibiting client was ESP Guitars, and we certainly took advantage of every promotional opportunity for them before, during, and (now) after NAMM. One of the key tenets of marketing communications, especially in the era of social media, is that even at the risk of being repetitive, you need to tell your customers what you’ll be doing at an event like NAMM, and then do those things, and then remind them what you did after the fact. 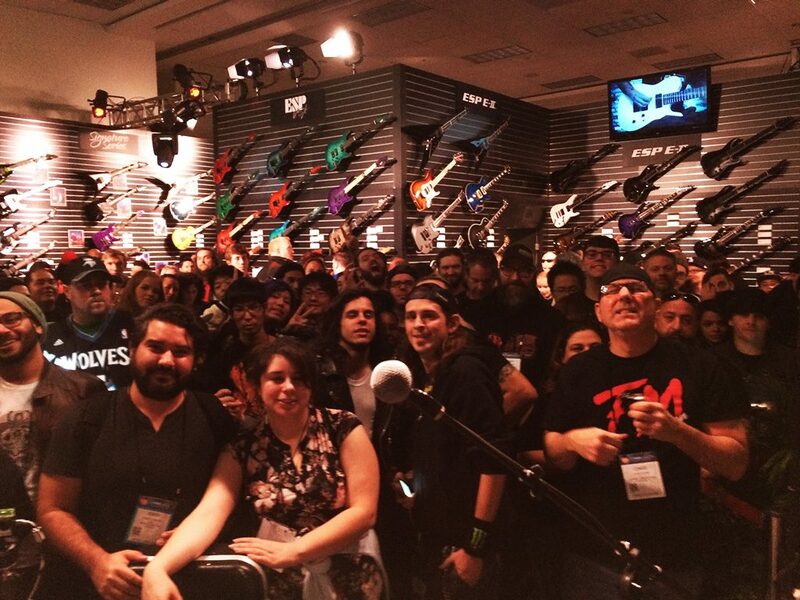 From a public-facing perspective, our main goals at NAMM were to feature the company’s high-profile artists in live performances and discussion sessions, but to also push the excitement of those events out to the millions of people around the world who weren’t physically attending the show… and to do it in almost real time. Fans congregate in the ESP booth before an artist performance event. After nailing down the event schedule with ESP’s artist relations team, we sent out email blasts to notify the ESP Guitars user community worldwide, as well as making multiple posts to ESP’s social media. We put together a plan along with ESP’s video production resource, Will Knapp of Napptime, and Dave Ruhr of ESP’s web and graphic design firm SilverFrog. The concept — which was more simple to ideate than to execute — was that we’d video short clips of performances and interviews which would require little to no editing, and then upload them to the ESP site “almost live” from the show floor. I’d then promote each clip with social media notices. It actually went extraordinarily well. The challenges had more to do with the time and speed (or lack thereof) it took to just process and upload the video files. However, everyone from the client’s management to their staff, their sales channels, and the end user community seemed to enjoy and appreciate being drawn in and informed as if everyone had been part of the show. 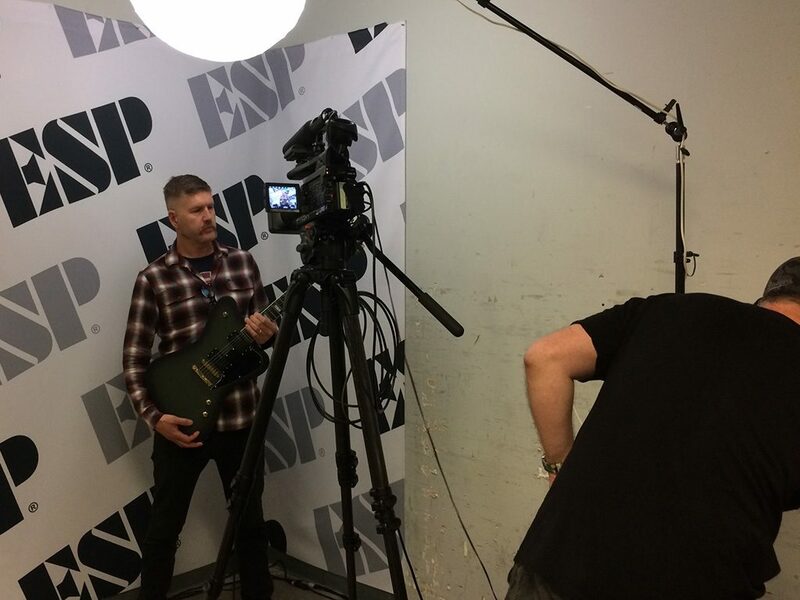 Mastodon’s Bill Kelliher joins me and Will Knapp backstage at the booth to shoot a couple of quick video interviews. The short version was posted immediately after filming; the longer versions are available as content we can use for post-show recap videos or other promotional content later on. The night a huge trade show wraps up is hardly when anyone feels like putting in some extra effort. However, the “strike while the iron is hot” rule always applies. So, just as the show ended on Sunday, we did an email blast out to the entire global ESP Community, letting them know that the site had been updated with the new models for 2017, and that they could view all of our NAMM performances and interviews in one convenient spot. This is how you really get your best bang for the buck at an event like NAMM. Trade shows are expensive and consume a lot of time and effort for you and your staff, so make sure you’re working with a MarCom resource that milks every drop of your messaging and makes the most of the opportunity to sell! Contact us today.